It was now near midnight and the silent, sleeping city lay bathed in a flood of glorious moonlight. The palace was transformed. The flat mud roofs had turned into marble; the tall slender minarets rose dim and indistinct, like sceptre sentinels watching over the city... It was no longer a real city, but a leaf torn from the enchanted pages of the Arabian Nights. For centuries the name Khiva has conjured up images of camel caravans laden with exotic silks and spices, bustling bazaars, glittering madrassahs, despotic Khans and the largest slave market in Central Asia. Intrepid explorers of the nineteenth century tantalized European society with tales of this mysterious and perilous desert Oasis. Today travellers are once more making their way along the Silk Road as cars and coaches replace the traditional camel caravans. Tourists flock to see Khiva's Old City which is the most homogeneous example of Islamic architecture in the world and has been awarded World Heritage status by UNESCO. 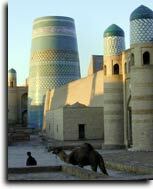 Some see Khiva as just another day stop on a busy coach itinerary. 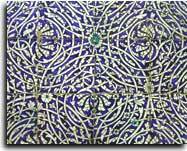 However this Internet Guidebook has been designed for potential visitors interested in scratching beneath the surface, seeking to discover the stories and intrigues behind the legend of Khiva. To explore Khiva's stunning Ichan Kala, (inner city) click on the map icon below, or for a fascinating glimpse into Khiva's rich cultural heritage and history, click on the Guidebook icon. With both these pages, just move the mouse over the different objects for an explanation and click on whatever you want to explore.